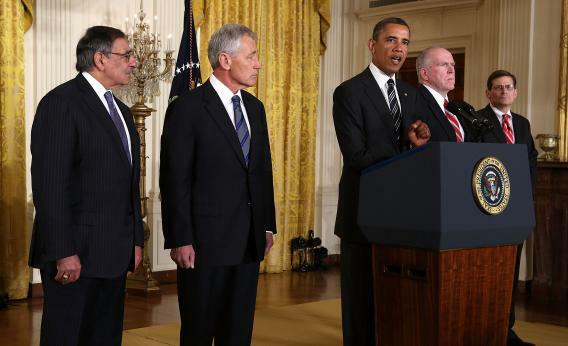 From John Kerry to Chuck Hagel: Why is Obama backsliding on female appointees? Why Isn’t Obama Appointing More Women? In a glorious moment of the mindless, hypocritical point-scoring conservatives so adore, yesterday Mike Huckabee gleefully accused President Obama of not appointing enough women to his Cabinet and insinuated that female voters who supported Obama were too snookered by promises of “contraception and free abortion” to notice his unwillingness to put women in leadership positions. Huckabee, who routinely refers to ovulation suppression as “abortion” and believes wives are obliged to submit to their husbands, is not convincing anyone who actually cares about Cabinet diversity that he does, too. Still, as disingenuous and opportunistic as Huck and his allies may be, it is disappointing to see Obama hand one prominent second-term appointment after another only to men. Feminist groups have taken notice, and the Women’s Media Center has started a petition demanding more female appointees to the upper echelons of the executive branch, starting with the Federal Communications Commission chair. The New York Times crunched the numbers and found that while Obama unsurprisingly has done much better than the Bush administration, he hasn’t bettered the Clinton administration, even though it’s reasonable to expect that the bench of potential female appointees is much deeper now than it was then. (It also seems reasonable to expect that, after giving so many high-profile jobs to women last term, from Hillary Clinton to Susan Rice, the trend would continue.) Women represented 43 percent of both Obama and Clinton’s appointments but only one-third of Bush’s. With Secretary Clinton being succeeded by John Kerry, the percentage of women in the Obama Cabinet is about to drop even lower; if Obama replaces Labor Secretary Hilda Solis, who resigned yesterday, with a man, he’ll be at Bush levels. Face-offs between uppity women and belligerent conservatives do turn into the kind of messy brawls that No Drama Obama hates, but by avoiding them, he’s being a coward. No one said getting more women into positions of power was going to be an easy process, but it’s one that has to be undertaken all the same.